Step 1 In a medium saucepan, bring the dried black-eyed peas and 1 quart water to a boil over high heat. Cover and cook over low heat for 45 minutes. Add a pinch of salt and simmer until peas are tender, 20 to 40 minutes more; if the peas look a little dry, add additional water as needed to cover while cooking. Remove from heat and set the peas, still in their cooking liquid, aside. Step 2 Meanwhile, clean and chop the chard: Pull the chard leaves from the stems and keep each in a separate pile. Peel the stems if they are stringy. Cut the stems in one-half-inch slices. Roll the leaves up, slice them in ribbons and coarsely chop them. Step 3In a deep, medium saute pan, bring 1 quart water to a boil and add a pinch of salt. Add the chard stems and return to a boil. Cover and cook over high heat for 2 minutes. Add the chard leaves, stir and return to a boil. Boil uncovered, stirring occasionally, until the chard is tender, about 3 minutes. Drain the chard, rinse it with cold water and drain it well. Dry the pan. Step 4Cut off the dark green tops of the leeks (discard them or use them to flavor the broth in the recipe for couscous with seven blessed vegetables). Cut the white to medium-green parts of the leeks in half lengthwise, leaving them attached near the base, and rinse them thoroughly, spreading the layers to clean off any sand between them. Cut the leeks crosswise into thin slices, about one-fourth-inch thick. (You will have about 6 cups.) Submerge the sliced leeks in a bowl of water and rub to separate the pieces. Let them stand about 2 minutes, and then lift them out of the water and drain them in a colander. If the water is sandy, soak them and drain them again. Step 5In the same saute pan, heat 3 tablespoons oil over medium-low heat. Add the sliced leeks and one-eighth teaspon each of salt and pepper. Cover and cook over medium-low heat, stirring occasionally, until the leeks are very tender, about 15 minutes. If there is liquid in the pan, cook the leeks uncovered over medium heat until it evaporates, about 3 more minutes. Remove from heat and transfer the leeks to a bowl. Step 6If using fresh black-eyed peas to garnish, shell the pods that have bulges, indicating there are developed peas inside. Break the slim pods in 1-inch pieces, removing any strings. Add the green pod pieces and the shelled black-eyed peas to a saucepan with enough boiling salted water to cover them, about 1 quart. Return to a boil, cover and cook the black-eyed peas over medium-low heat until they are done to your taste; their cooking time can vary from 7 to 20 minutes. Drain them and spoon them into a small serving bowl. Drizzle them with 1 to 2 teaspoons extra virgin olive oil and sprinkle them with salt and pepper to taste. Step 7Drain the cooked dried black-eyed peas, reserving their liquid. In Recipes-list.com we have selected the most viewed recipes from category - Vegetables Vegetarian . Enjoy the best recipes specially selected for you! 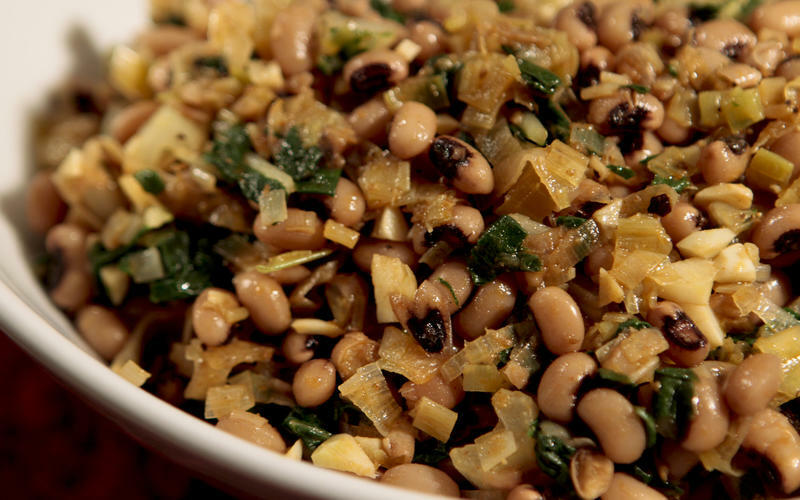 Black-eyed peas with leeks and chard is the right choice that will satisfy all your claims.